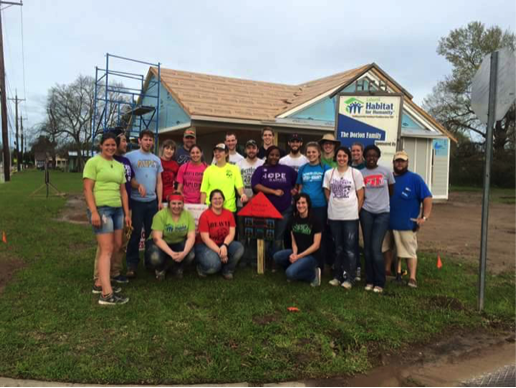 Habitat for Humanity is the largest club on Blackburn College's campus and has approximately 30 active members signed up this year. We have the great opportunity to participate in a new Collegiate Challenge in Palm Beach, Florida this year to build a house during our Spring Break. This year, we would like to bring 10 members to Florida and live up to the expectations of Blackburn’s motto of Learn.Work.Earn. Through the volunteer services we will provide in building houses, working in the Habitat Restore, and helping a community. We couldn’t be more excited to return to the South again this year, but will be meeting a whole new family and having a new experience for Blackburn students. It is our hope to have enough monetary support for matching uniform t-shirts for the build, so then the Palm Beach community can identify us from Blackburn College. It is important to represent ourselves professionally and as a functioning group. We would also appreciate some monetary assistance in paying for some of the gas expenses and insurance we will be expected to pay in order to get to Palm Beach. We have allocated for half of the trip and still are fundraising to support the other half. For more information on what Blackburn College Habitat for Humanity has done in the past in Jackson County, Florida and Lafayette, Louisiana please search the two links below for a small preview of Blackburn students building as much of a house in only seven days (or equivalent to our Spring Break) all while having fun, staying positive, and helping a family in their community. Approximately how many people were involved in the project? 19 students attended along with 1 advisor last year. Who directly benefited from the project? Did you encounter any unforeseen snags or setbacks? Please explain how funds were expended? The funds we had last year were expended solely for the Collegiate Challenge Program fee. This consists of a $175 per person fee for the affiliate contribution to Lafayette, Louisiana. This fee is for the affiliate host site so they can support the work Blackburn College tackles with building materials, food, and any other necessities. The previous year the cost of driving and renting vehicles increased, which exhausted a majority of our budget. This past year, we were also in charge of our breakfast and dinners, which depleted our budget. Please attach or provide a link for photographic documentation? Blackburn Members always find the Collegiate Challenge to be rewarding, but very hard work. In Lafayette, Louisiana we were given our very own wooden house representing how much money our chapter donated, along with how many volunteer hours were put in (a whopping 519 volunteer hours!!!). 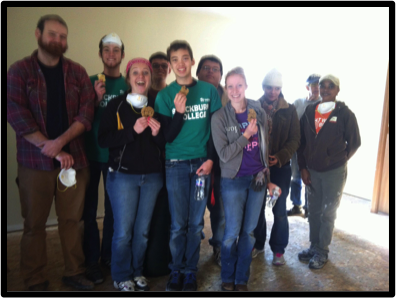 Pictured here is the Blackburn Collegiate Challenge members with the house in Lafayette that we worked on. Part of the 2016 Collegiate Challenge group from Blackburn College. 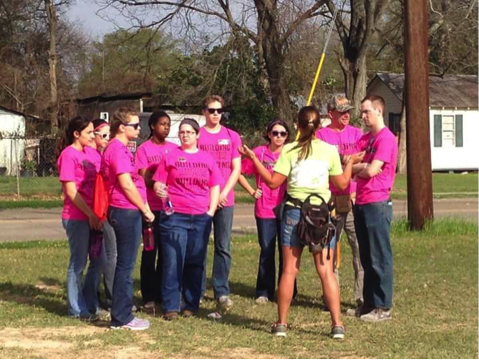 19 students volunteered during their Spring Break for a great cause in Lafayette, Louisiana. The woman in the green was the Head Construction Director, Brandi. Blackburn Students putting up drywall, taking out carpet, and deconstructing interior bathrooms. We are holding cookies that neighbors brought over in thanks for helping their community. 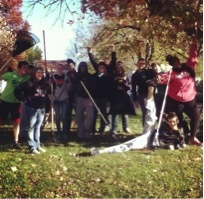 Fall Clean Up fundraiser Blackburn College volunteered around our school’s community, Carlinville, IL. The people in our town loved our community services and donated money, bags/rakes, and even hot cocoa! This is a link to a movie describing everything we do in Florida! You should definitely check it out. Be prepared for fun music, awesome volunteers, and lots of wonderful changes in our world! 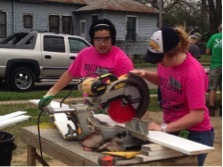 Juniors, Makayla Grove and Wendy Pocklington putting up siding on a house in Lafayette, Louisiana. Team work makes the dream work! 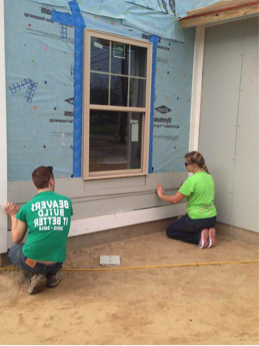 Blackburn students learned many new skills on this Collegiate Challenge to Lafayette, Louisiana, such as: how to lay tile, painting, and putting siding up. Junior, Tommy Millburg, and Blackburn Alum, Allie Tonsor, learned how to properly use a table saw in order to cut the siding to be the right size. Even on rainy days, Lafayette had Blackburn students working hard. Half of the club stayed back at the houses to paint and lay tile, while the other half traveled to the warehouse, where they helped reorganize, knock down a couple walls, and build some furniture. Pictured above is sophomore, Kaitlyn Scott, painting in one of the two Lafayette houses on a rainy day.